WILLIAMSBURG — Marvel's Netflix television series "Daredevil" has been filming in Williamsburg and Greenpoint under the code name "Bluff," using popular dive bar the Turkey's Nest Tavern as the setting for a criminal's hangout, according to locals and film permits. 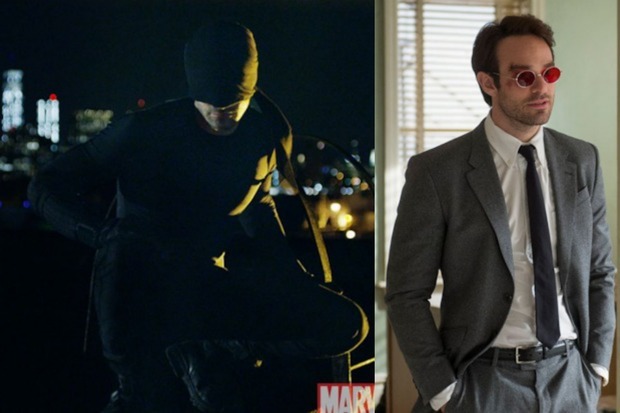 While the "Daredevil" name has not been openly used by the production team, residents said the film crew told them they were shooting the Netflix series using the alternate title. City filming permits have also referred to a "Daredevil" character in notices about the shoot, with the production team behind the series also listed on the notices. The new series by Marvel, ABC Television Studios and Netflix is based on the comic book about blind superhero Matt Murdock and is set to debut on Netflix in 2015. It stars Vincent D'Onofrio, who plays villain The Kingpin, along with Rosario Dawson, Charlie Cox and Deborah Ann Woll. Marvel officials have said that the comic show, which is set in old Hell's Kitchen, would be filming throughout Brooklyn and Long Island City. The filming notices have also referred to the show as "Bluff." Turkey's Nest Tavern, located at 94 Bedford Ave., was transformed into "Josie's Hell's Kitchen" on Wednesday, featuring a neon sign and Irish flags. A location scout told two witnesses Wednesday that the shoot was in fact for "Daredevil." Josie's is the name of the bar "frequented by criminals and other lowlifes" in the series, according to The Marvel Comics Guide to New York City, and is where Daredevil visits when he's trying to get information from criminals. Employees at Turkey's Nest were only informed that the show was called "Bluff." Previous shoots throughout the city using the name "Bluff" have also been revealed to be "Daredevil" shoots. The show has used at least 20 locations in Williamsburg and Greenpoint, according to permits for "Bluff." Between 9 p.m. on Oct. 14 and 2 a.m. on Oct. 15, ABC Television Studios was scheduled to use an empty lot at 32 India St. to film a fight scene in which "Daredevil in black uniformed costume beats up guys to get information," said a notice from the Office of Citywide Event Coordination and Management. The next night, the studio was set to use a handball court in McCarren Park to shoot "Daredevil in a black costume" beating up a "Junkie drug abuser," a notice said. It was also scheduled to use an alley on West Street near Greenpoint Avenue that night to film a scene where a biker pushes Daredevil into eight motorcycles, a notice said. Then, on Saturday, Oct. 25, a warehouse on Greenpoint Avenue in Long Island City was set to film the scene of a fight between Daredevil and "a ninja with a kyoketsu-shoge knife on a chain." Flames and an air cannon with debris were involved, the notice said. The Mayor's Office of Media and Entertainment referred questions to the studio. A representative with ABC Television Studios did not respond to requests for comment.